Have you ever experienced your tour from the perspective of your guests? Are you sure it’s as exciting as you think it is? We’re here to tell you that there’s always room to improve. Should you be adding a story? Maybe using a prop? That’s a lot of questions, but really, how can you make your tour stand out? It’s time to treat your tour like a performance, but not a one-person show. Nothing will kill a good tour mood faster than a tour guide delivering a no-interruptions-allowed monologue. Each tour should be different because each participant will add their own flair to the experience. When starting your tour, make sure each attendee is hooked up to a ListenTALK device. Nothing foils the tour experience more than a tour guide that can’t be heard. • Tell them a story. Good tour guides know the facts and retell them in a way that invokes excitement and involvement. Great tour guides will take you on an adventure through time and space. • Know your flow. The bulk of your tours will be the same day by day but allow yourself to cater to the adventurous souls of your participants. You’re allowed to spend more time engaging them with the things they’re interested in and breeze through other parts of the tour. Don’t fear the flow. • Set your script—then stray from it. The majority of your tours will follow the same script tour after tour but allow yourself to stray from the script. Take your time to create the tour narrative beforehand, then get to know your participants. When you allow your participants to engage in your storytelling, their questions and comments will help you personalize each tour. Groups are more engaged when they can actually hear. You’ll be surprised that as each member of your group wears their own ListenTALK device, tour engagement will shoot through the roof. 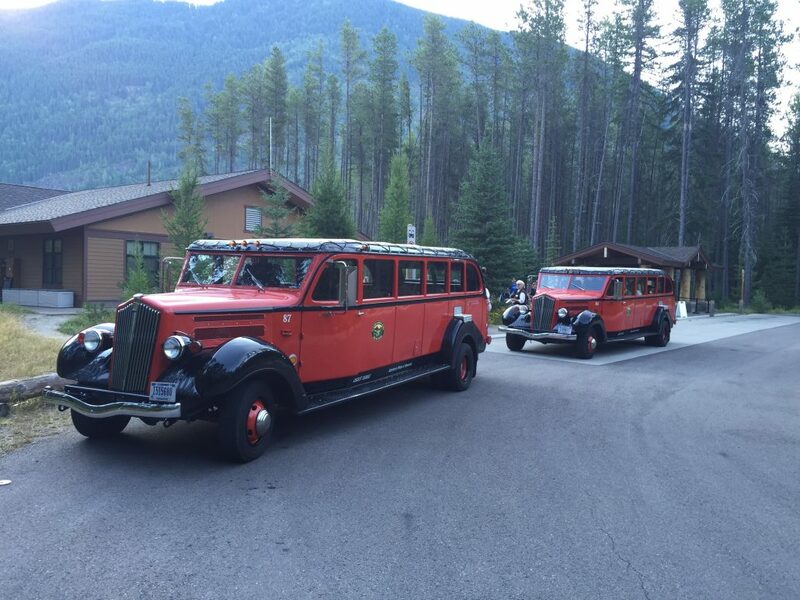 The back of your group will be just as enthralled with the adventure as the patrons in the front. Taking your tour groups on an adventure will be more memorable than presenting them with a memorized monologue. Now, go ahead. Take a risk. Tell a story. 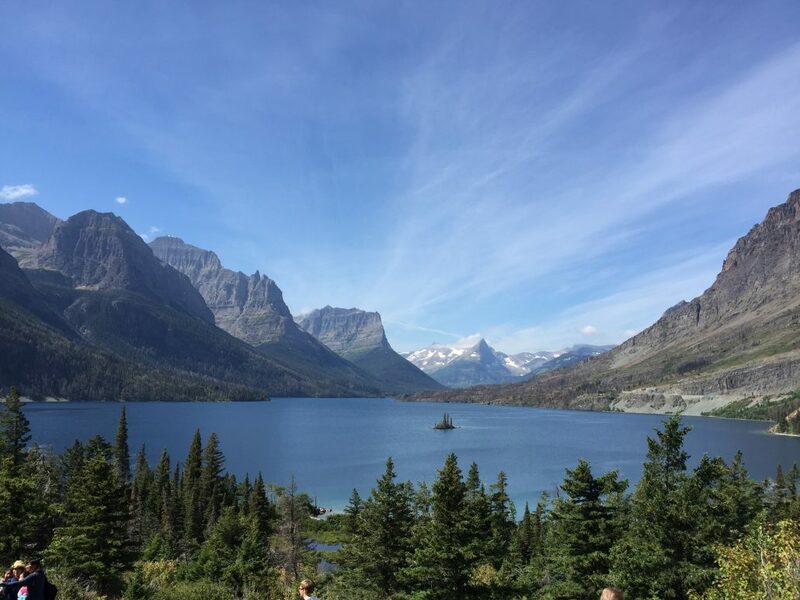 Adventure awaits with ListenTALK. Imagine, if you will, being a working member of the AV industry and having the opportunity to tour one of the most advanced AV spaces in the world. You’d feel as excited as Charlie Bucket pulling a golden ticket out of a Wonka Bar. As one of the final events of AV Week, Listen Technologies, along with many others in the AV Industry, had the opportunity to take our tour guide equipment on the road and use it to tour the incredibly impressive Adobe building in Lehi, Utah. The space is so impressive that it feels odd to call it a mere building; it works more like a big, creative campus where employees are encouraged to eat, drink, rock climb, play, think, collaborate, and yes…even get work done from time to time. There are probably many people who would love to wander through the incredible spaces at Adobe, especially on a guided tour using Listen equipment—it’s a great experience! But for those of you who haven’t had the opportunity yet, please sit back and enjoy my description. When first entering Adobe, you’re taken through what is known as the Customer Experience Center. This is an area that highlights all of Adobe’s clients with 40, 10.2” video monitors. Each monitor digitally displays a client’s logo along a long hallway; the videos are on a continual loop throughout the day along with interesting statistics provided by Adobe. Visitors can have an interactive experience using the three 2 x 2 video walls and touch screens to find information of their liking. This was a very interesting way to start the tour as it highlighted some of the things that Adobe provides clients that many people don’t often consider. In other words, Adobe isn’t just about software updates; they also provide their clients with serious marketing research and data. Once you are through the hallway, you reach the Network Operation Center, or as they refer to it NOC! NOC houses 24 NEC LCD displays, which are wall mounted with RP Visuals swing wide mounts. The video routing and room control is accomplished using Crestron Digital Media and control products. The Crestron touch panels allow employees to monitor specific company systems and other important statistics that are essential for daily operations at Adobe. For example, an employee can monitor anything like how many hits the Adobe site is getting per day to specific #hashtags being used on various social media sites. There are many other incredible spaces at Adobe, as well. Their training rooms and collaborative meeting rooms (all named after creative geniuses, artists, or sports legends) are all equipped with state-of-the-art technology. All of these rooms have a combination of a number of projectors, monitors, PC’s, Blu-Ray player, connections for VGA, HDMI, and mini HDMI, gooseneck and wireless microphones, and a touch panel to control the system. The rooms also have Polycom audio and video conferencing systems and Ploycom EagleEye Director cameras that allow others to learn from other Adobe locations all over the world. The more collaborative spaces are less formal and lend themselves to more creative thinking. These rooms all house a Wink paint surface, which allows a user to write and draw their meeting ideas on the wall with markers. If the user wants to save his or her notes, there is E-Beam technology build into the projector, which will capture what has been written or drawn on the wall and save it to the PC in the room. Adobe employees also have the benefit of an onsite fitness center, a café, and many different game rooms. Televisions showing satellite programming are installed throughout these spaces for employees to catch up on news. Digital Signage monitors are placed throughout delivering employee communications created by Adobe employees. From menu items and specials to upcoming fitness classes AV is a part of their communication. Although it was closed during the tour, the lower level boasts a serious gamer room (I’m not sure what serious gamer means, as I’ve never been serious about video games, but it sounds pretty intense). And the upper level has a room with ping pong and billiards tables, as well as some old school arcade games. There’s also a basketball court and outdoor spaces for employees to relax or play sports. There are also some incredible art pieces located throughout the building, the most notable of which was the spray painted mural by El Mac, which is located near the most communal area of the building. Andrew Smith was commissioned to install another great piece in the stairwell. It’s a 50 foot, interactive, metal sculpture that climbs up the open space of the main between the main and top levels. Between floors employees and visitors can take various colored balls found in baskets and feed them into the sculpture. The balls them zoom down to the main level. I think I’d spend more time with the art than in the serious gamer room, but to each their own, right? 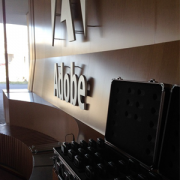 Even as a new member of the AV industry, I felt like I’d won a golden ticket while touring the Adobe building. While I didn’t understand all of the impressive technical terms, I knew that what I was experiencing made for a great environment in which to work. It is definitely a space where technology works seamlessly hand-in-hand with collaboration and creativity. 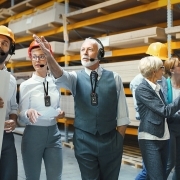 If you have ever been on a tour of a manufacturing facility, you’ve probably experienced difficulty hearing your tour guide. To make sure you heard what was happening on the tour, you might have had to stay too close to your guide or your guide might have had to scream at the top of his or her lungs to be heard. Neither of these things creates a great tour experience. Focusing this much on a tour guide may have made you potentially miss out on some of the interesting things happening around you. So, what’s the point of going on a tour when you can’t hear and you miss out on all of the interesting things? Listen Technologies’ portable RF equipment solves these issues. You don’t have to stand too close to your tour guide and your tour guide doesn’t have to risk losing his or her voice. The tour guide simply uses a microphone that is plugged into the speaker which wirelessly broadcasts his or her voice to people going on the tour. This allows visitors to both hear all the facts being said without interruption, as well as focus on what’s actually happening on the tour. Even though the settings or surroundings might change, the consistent, high-quality sound won’t. In other words, you’re not going to miss out on anything! The video below follows Oldcastle Precast during a factory tour as they use Listen’s portable RF equipment. If you have questions about our portable RF product, let us know in the comments below. The Ely Cathedral is steeped in history. Originally, the site of a monastery founded by a runaway princess turned nun, the cathedral grew from a rather humble site to an awe-inspiring site that covers over 46,000 square feet, including the famous Ely octagon measuring at 170 feet in height and 742 feet in width. Although the cathedral has had its fair share of pilgrims, it’s highly unlikely that its original purpose was to host bus-loads of tour groups snapping photos of its famous stained glass and restored stonework. Nevertheless, around 250,000 contemporary pilgrimages are made to the Ely Cathedral every year, which makes for some very busy (and possibly hoarse) tour guides. Cathedrals, while being wonderful places to worship have rather specific challenges when it comes to the subject of acoustics. While some of them offer wonderful places to sit and listen to choral arrangements or reflect on the soul, they aren’t really built to be tour group or tour guide friendly: a small footstep can carry from one end of a nave to the other, mere whispers can echo, and the smallest giggle can be carried from the floor all the way up to heaven. So, how is a tour guide supposed to relay information, without shouting or whispering? And how is a tour group supposed to hear their guide without being shouted at or straining to hear? Instead of spending pounds of sterling on honey and tea to sooth the sore throats of their busy guides, the Ely Cathedral thought of a better idea to solve their tour acoustics situation, they invested in Tour Group equipment from Listen Technologies. 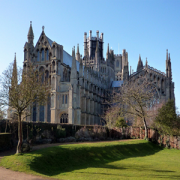 Listen’s Portable RF products allow a tour group user to simply plug into a small receiver that they carry with them throughout a tour, in this case the tour of the magnificent Ely Cathedral. A tour group member can adjust his or her own volume and will receive clear and consistent sound from the guide for the duration, so they don’t have to miss a single word of what’s said, even while other tours are happening simultaneously. The products are also a miracle for the tour guides as they allow them the opportunity to use a normal speaking voice, which is broadcast from a transmitter to each and every tour guest, so there’s no need for tea, unless it’s actually tea time. Although it’s a place with a past, the Ely Cathedral is definitely looking at the present. Including a little technology from Listen to improve guided tours has made the cathedral a better place to visit, whether a guest is there on a personal pilgrimage or merely there to enjoy the beautiful stained glass. 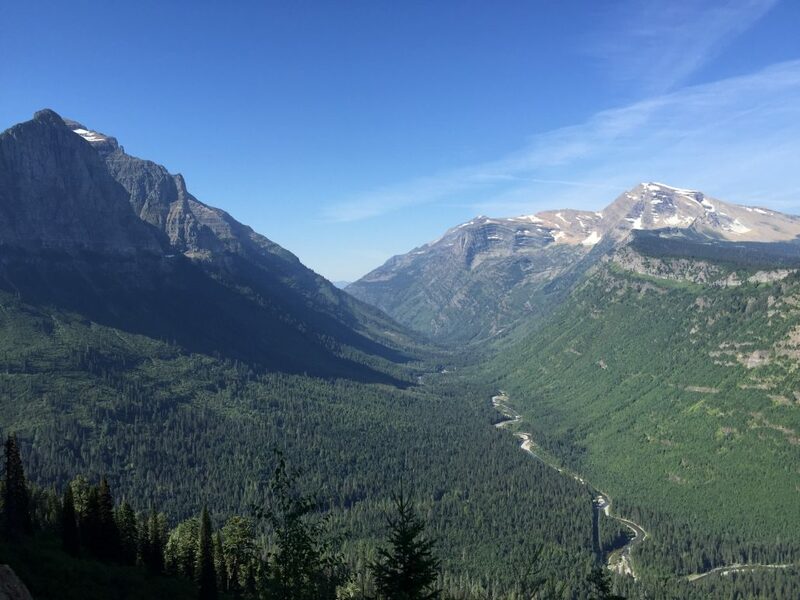 This blog post has been repurposed from an anonymous customer write-up from a university in the Pacific Northwest on their experience with Listen Technologies Tour Group products. We recently became aware of some great things a large state university in the Pacific Northwest is doing with our Portable RF System. More specifically, it’s the university’s off-campus community extension locations using our system. And while we can’t share the name the university at this time, we’re so thrilled with the results they’re achieving we can’t help but share. 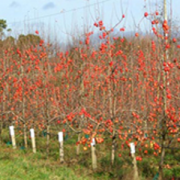 As a part of this mission, several locations regularly conduct educational field tours at locations such as apple orchards and agriculture packing houses and processing facilities. Depending on the tour, they are attended by growers, crop consultants, managers of other agricultural facilities and even scientists. The problem with doing tours in such locations, however, is the noise. For example, imagine a tour of a busy apple packing house where conveyor belts and machinery are constantly running. To add to the problem, tours of such potentially dangerous facilities often require attendees to gather in single file lines behind barricades for safety reasons. First, the sound projected from the speaker was unidirectional, meaning attendees had to stand in just the right place to hear. This was a significant a problem when dealing with a large group or a group that had to be spaced out single file. Second, they discovered that despite the increased volume of the tour guide’s voice, environmental distractions were still an issue. This was particularly true in outdoor locations, such as apple orchards, where it was easier for a group to disperse and hold side conversations. As a result, they went in search of a better solution that would allow guides to truly capture the attention of tour attendees. They found Listen’s Portable RF System. 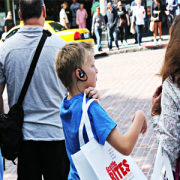 Listen’s Portable RF System is ideal for tour groups. It has the capability to scale from one user to hundreds and can operate across multiple groups; ensuring interference from neighboring systems is kept to a minimum. The technology is also very easy to use. Tour guides simply clip on a small microphone and transmitter and then set the device to the desired channel. It’s even simpler for audience members, who have to simply slip on a headset that can be pre-set to the correct channel and waiting for them. The technology is very easy to use. In most cases, especially when it comes to portable radio frequency-based systems, it’s as simple as clipping on a small microphone and transmitter and then setting the device to the desired channel. It’s even simpler for audience members, who simply have to slip on a headset that can be on waiting for them and pre-set to the correct channel. With our system in place, the university is now able to ensure that all participants can not only hear every word the guides speak, but that guides no longer have to compete with environmental distractions for the attention of the attendees. More information about Listen Technologies’ Portable RF Systems can be found here: https://www.listentech.com/products/portable-rf.html. When in New Orleans, try the gumbo. Visiting Philly? Cheesesteak, of course. Seattle? Try the Fish! What better way to explore a city than by sampling its culinary masterpieces? Seattle Bites Food Tour does just that. For three hours, tourists, both vacationers and locals, experience the rich history and culture of Seattle’s famous Pike Place Market while sampling the crème de la crème. I had the privilege of experiencing the tour first hand with my family this summer as we spent time in Seattle on our way to a family reunion. Meeting just inside the Seattle Art Museum we were greeted by the energetic Anna Oeste, our host for the day. We each received a bag with the materials we would need. Among the napkins, map, and plastic ware was a Listen Technologies receiver and ear speaker. Anna easily walked us through how to use the equipment while weaving in snippets of what we would be experiencing. As we began walking towards the Pike Place, it quickly became apparent that not only were the receivers a nice touch, but they were a necessity. You see, the market was bustling with activity, but since Anna was using the transmitter, we didn’t miss a single word. And even when we lost sight of Anna in the busy crowd we could follow the directions she relayed. Lummi Island smoked salmon flatbread with crème fraîche and fine herbs – a culinary masterpiece! Paris-inspired fruit and Nutella crepes by an Indonesian beauty. Authentic Mexican tacos or tamales made fresh from a US culinary graduate born and inspired in Mexico City! Decadent Alaskan king salmon, fresh and house-smoked for 12 hours by “The Cod Father”. Mom-inspired chicken Tikka Masala from a classically French-trained South Indian chef. Fresh and exotic produce of the season from our boys on “The Corner”. Seattle’s coffee at its best – expertly sourced, blended and roasted. Simply Seattle, simply delicious! Special home-made desserts using some of the world’s most unique cooking oils! Surprisingly enough, one of my personal favorites was from Saffron Spice, a unique Indian food stand. My husband was delighted to see how much I enjoyed the Chicken Tikka Masala. You see, normally I stay away from most could-possibly-be-spicy foods while he loves trying new tastes. Braden loved the last stop, the Olive Oil Balsamic Vinegar Tasting Room, where he learned how to mix specialty oils and vinegar creating tasty combinations. As their website states this “tour of The Market is more than simply a sampling of big and delicious bites. Seattle Bites Food Tour will share with you the complex and fascinating tales of how and why The Market got started, the heroes that created and saved it and the beloved merchants who have made The Market their home.” Thanks Mark and Anna for a great day and a up-close look at our technology at work!